Lisa Earthgirl – Gardening Tips and Helpful Advice » Spring Flower Power! 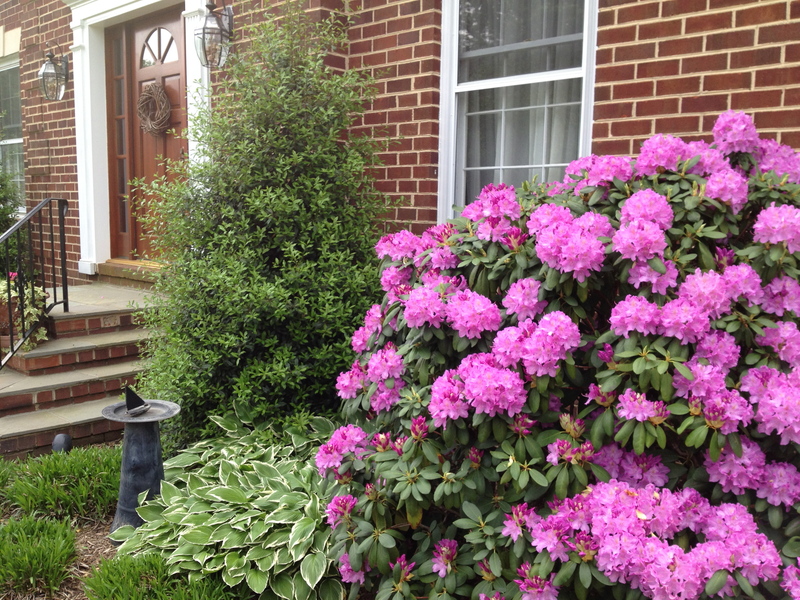 The rhododendron is now fully in bloom! The daffodils are all kaput, but now we have the second phase of gorgeous Spring blooms upon us. 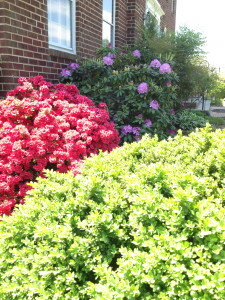 The azaleas, rhododendrons and roses are blooming in abundance. How picturesque! I just love to see how things change every day in the garden. Even the greenery is beautiful now with its flush of bright new growth. I don’t even mind the occasional sneeze from pollen when things are this beautiful outside. I like to use slow release fertilizer on my roses to make sure they are always fed. I’m often asked when is the best time to trim these flowering beauties. It’s right after they have finished their blooms. This is also the best time to fertilize. Roses are heavy hitters, and will need a boost of food throughout the growing season for their repeat blooms. 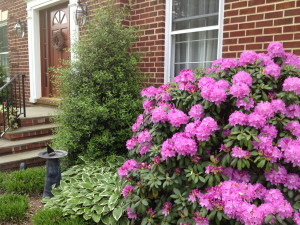 Azaleas and rhododendron are best fed just once, right after blooming. I prefer a slow release fertilizer, but there are so many varieties out there that you can find one to fit the needs of every gardener. Hydrangea is best cut now, just above the third set of leaf buds. This is also the time you can alter the soil to get either blue or pink flowers. To get blue flowers add coffee grounds for more acidic soil, and to get pink flowers add some slow release lime to the soil to make it more alkaline. What a treat! A cardinal has chosen our garden for her nest this Spring. 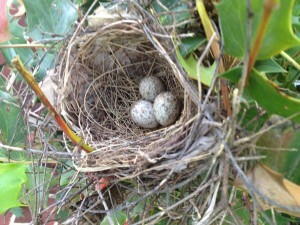 This year we have so many nests that I’m having a hard time keeping up with which nest belongs to which bird. This cardinal nest is right outside my living room window and has been so much fun to watch. It has three eggs, and I think they will be hatching this weekend. I’m hoping to get some photos of the new baby birds to share. The mahonia bush is filling out now with new growth, and it’s getting a little more difficult to spy! 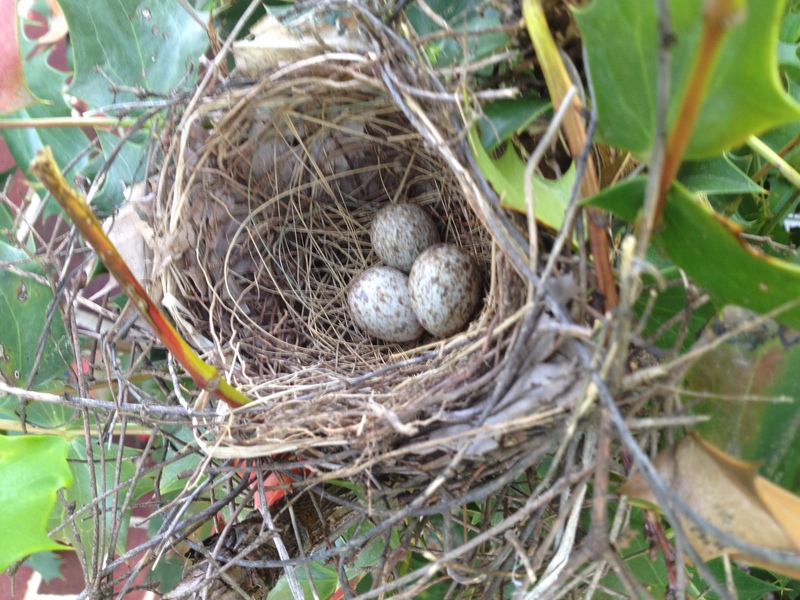 We have many robin nests and a few catbird and dove nests as well. Perimeter garden creates texture while providing a barrier to keep rainwater in our yard. The perimeter garden is really filling out this year with its fresh new growth. Loosely based on a Japanese style, it has been a work in progress for about a decade. I have been adding to it, and going for variety in color and texture to add interest throughout the seasons. 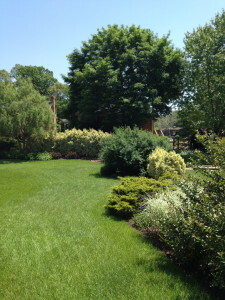 There are three kinds of junipers, silver king and emerald euonymus, choke cherry, cardinal holly, variegated and solid green ornamental grass, lariope, curly willow and several different perennials planted in groupings. This is the lowest spot in the yard and the garden serves to stop rainwater from leaving the yard, and with that, any fertilizers I use in the grass. So, form and function both prevail here — and why not, with so many possible choices for us to select from these days? My best tip on selection is to see what grows best in neighboring yards, and always choose native plants when you can. 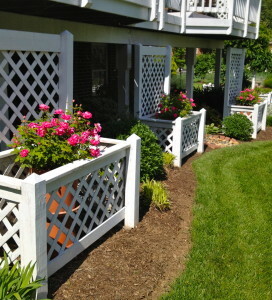 The boxwood sustained snow damage last winter, but you’d never know it now. Trimming out the damage has lead to a lot of new spring growth. This is also the time to check all your plants for remnants of winter’s damage, and prune out what is cracked, torn or dead. With any luck the holes will fill in with new growth quickly. In a few weeks some additional pruning will probably be necessary to even up, or thin out the new growth, but it’s better to get rid of the bad so that disease doesn’t have a chance to set in. Another thing to start thinking about is how many of your plants may need staking up so that you can get supplies in before they sell out. 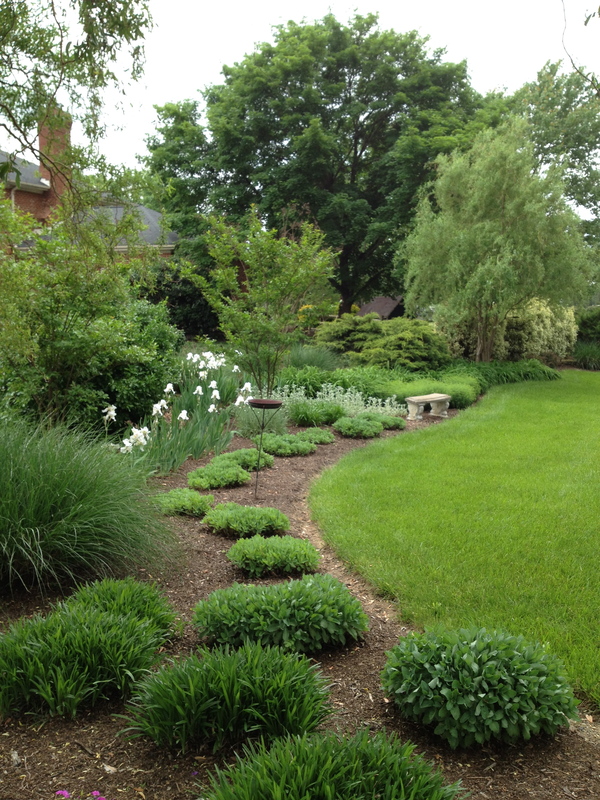 I usually stake some of the perennials here – sedums, daisies, and ornamental grasses, too. It helps to prevent breakage in heavy rainstorms. Now, back out to enjoy this beautiful spring weather – hope everyone is doing the same! What a difference a couple of weeks make. The white iris are starting to bloom, when they get to their full height, they usually need staking, so I have green stakes the perfect height to use. They completely disappear!